Years ago the Walleye Shack Restaurant was doing so much business selling fried fish out of a 400 sq. ft. building in the town of Valles Mines that they needed a bigger place. Enter architect Paul Otto... The likely place: near their present restaurant south on Valles Mines School Road on the Chat Pile. That would give them 3 acres of parking and a lush natural setting spanning Valles Mines Creek and across from the historic Church House site. The plan combined a Restaurant and Road House. But progress stopped with the announcement of the upcoming MoDOT "Interchange Project at State Road V and Highway 67." The uncertainty of whether there even would BE a Chat Pile after MODOT's huge project forced the Walleye Shack to make a hard decision: Either accept a VERY attractive lease in Desloge immediately OR wait years hoping MODOT might leave enough of the Chat Pile to build their new restaurant on. Restaurant and Dance Hall with Retail shops. with overpass and exposure to 28,000 cars a day on Hwy 67. So far, it has had to wait. 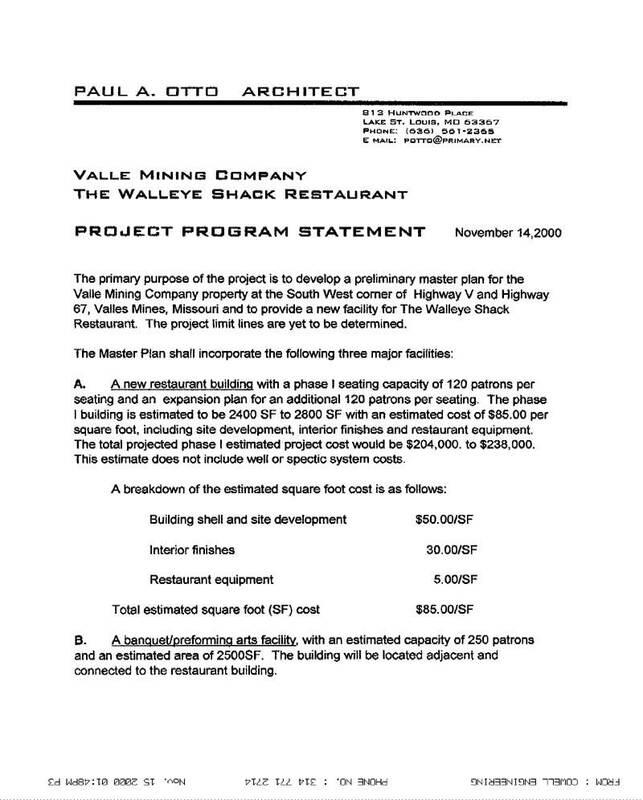 Although people lined up at the old place for their Alaskan Walleye fried in peanut oil week after week, to date, no restaurant stands in Valles Mines. The Walleye Shack Restaurant, successful in Valles Mines, moved to Desloge but closed within months.